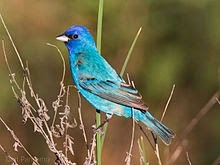 Husband Walter and I have had several visits this spring from indigo buntings. Each sighting in our backyard has included three males, the brilliant blue plumage an indication they were ready for serious courting. They were never close enough for a photo, but I got a satisfying photo fix of the colorful species via Gail Dixon’s blog Louisiana Belle here. 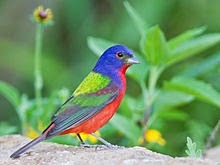 My first encounter with real live indigo buntings was the spring of 1980. A whole flock of these remarkable little beauties along with brown females appeared in our backyard, just a few feet away from the sliding glass door in our kitchen. In the middle of the flock was a lone male painted bunting. He looked exactly as if he had actually been painted in rich jewel colors. He didn’t look real. He was beautiful but startling with dark blue head, chartreuse back and red-orange breast. I recognized both bunting varieties. I had seen their illustrations on the cover of my birding field guide every time I had attempted to identify an unfamiliar bird. I sat at the kitchen table and watched--unseen, immobile and barely breathing as the living works of art pecked around in the newly mowed St. Augustine grass. There I remained until the group took flight. By the next spring I was freelancing, writing for Mississippi-Alabama Sea Grant, a marine-research funding consortium headquartered at the Gulf Coast Research Laboratory. Locally referred to as “the Lab,” the Gulf Coast Research Laboratory occupied a thickly wooded 52-acre peninsula bordered by a bayou and Biloxi Bay. Early on, I rode my bike to the Sea Grant office to discuss new or ongoing projects. One of the perks of that work was seeing the indigo buntings, red-headed woodpeckers and a variety of other birds, mammals and reptiles on the grounds of the Lab during the various seasons or in the surrounding waters. By 1997 I had been fulltime with Sea Grant for more than a decade. In April of that year I accepted a position with the GCRL, packed up and walked across the parking lot to my new office and new title as GCRL public information officer. I loved that I would be going to work every day in an intellectually stimulating environment with less travel than Sea Grant required and with much more opportunity to be outdoors. It had been years since I rode my bike to work and the years came with changes in the varied habitats that had welcomed birds in our town. Development had gradually pushed eastward. Privately owned areas closest to the Lab’s campus had changed from woods and diverse undergrowth to concrete and asphalt that served residences complete with over-fertilized lawns and landscapes. The GCRL had expanded its footprint, too. I rarely saw the redheaded woodpeckers that once welcomed me onto the campus, and I no longer saw the indigo buntings at all. I don’t wish for those "good ole days,” but I do miss the exhilaration of seeing those amazing buntings and woodpeckers every year. Perhaps my recent sightings signal a comeback to our area. One can hope. The buntings are so stunning, and so lucky that you have seen both kinds. Only one time we saw an indigo. I read something fascinating abut them. Their feathers are not really blue, it is the way the light changes when it hits their feathers. No matter what causes it, they are just SO beautiful!! Wow, those are incredible photos. What beauties! in my nearly 70 years i have never seen either one of these birds and they are amazing and they are living works of art.... so beautiful. You sure had some great adventures in your work life. I've never seen either of these birds, but would dearly love too. My Sis says I should move to LA and enter a retirement home with her,then I would see the birds as they are on the flyway not yet, I tell her,not yet. What beautiful birds! I've never seen anything like them, in our neck of the woods, but I'd sure love to! Seems our indigos are not as numerous at the swamp these days or maybe they caught on to my secret place in the bird blind. I was also lucky enough to spy a painted bunting, but it was a young male, so all his colorful plumage has not come in yet. By the way, I loved your phrase: "living works of art." How true! Gorgeous, amazing "living works of art". We don't see these around my neck of the woods. So sorry I haven't been looking at blogs for a while. Between Mexico and getting the Mexico Lung and working on our huge Church Conference...I think I am finally back among the living again. Wishing your dear Hubby a very Happy Belated Birthday too. Wonderful to be able to see such colourful birds - makes me remember seeing bee-eaters in France. We don't have such exotica here.